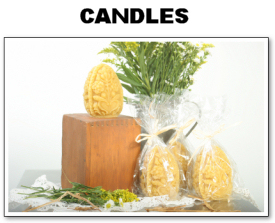 Beeswax candles have been highly prized since ancient times. Honey bees, long regarded as models of industry and purity, make their wax from the nectar of flowers. Pure beeswax candles, with their delightfully sweet fragrance, burn longer, more cleanly, and give off more light than other wax candles. Pure beeswax may develop a film called "bloom" which can easily be removed by buffing with a soft cloth. Honey, candles, and beeswax are unique natural gifts for family, friends & even your loved ones in the military ~ for all occasions! Birthdays, Anniversaries, Holidays or Just Because... Let us pack & ship your gift with a special message from you! At checkout, just select "This is a gift" option and include your message which will appear on the packing slip.